— Applicant is a current SCBWI member residing in Illinois. — To allow others an opportunity, do not apply if you have received free attendance or a scholarship from SCBWI or its Regions to any SCBWI events in 2017-2018. — On the online application form, you will be asked to provide contact information and an explanation of 100 words, detailing how this year’s Marvelous Midwest Conference will impact your writing/illustrating career. — Of those who apply, one name will be drawn at random. Your 100 words will qualify you for this drawing and demonstrates that you have examined the details of this specific conference and are invested in attending. Will award a scholarship to one Indiana SCBWI member to cover the cost of one early bird registration for the 2019 Marvelous Midwest Conference in Naperville, Illinois, May 3-5. Although scholarships are not completely based on financial need, we kindly ask applicants to keep in mind those members who could not otherwise attend without this opportunity. Winners of scholarships will not be announced publicly. Send essay and contact information to Shannon Anderson: indiana-ra@scbwi.org by January 30th. We will be awarding a scholarship to one Iowa SCBWI member to cover the cost of the early bird registration for the 2019 Marvelous Midwest Conference in Naperville, Illinois, May 3-5. Although scholarships are not based on financial need, we kindly ask applicants to keep in mind those members who could not otherwise attend without this opportunity. Winners of scholarships will not be announced publicly. Send essay and contact information to Eileen Boggess, iowa-ra@scbwi.org by 5:00 PM, January 20. SCBWI Michigan will award one scholarship to a Michigan member attending the Marvelous Midwest Conference May 3-5, 2019 in Naperville, Illinois (suburb of Chicago). The scholarship will cover the cost of one early bird registration ($295). Although scholarships are not based on financial need, SCBWI-MI asks applicants to keep in mind those members who could not otherwise attend without this opportunity. Thank you. The winner will not be announced publicly. Send essay, contact information including email address, and membership expiration date to Michigan-ra@scbwi.org and include “Marvelous Midwest” in the subject line. Applications are due January 25, 2019. No exceptions, please. We will be awarding a scholarship to one Ohio North SCBWI member to cover the cost of the early bird registration for the 2019 Marvelous Midwest Conference in Naperville, Illinois, May 3-5. Although scholarships are not based on financial need, we kindly ask applicants to keep in mind those members who could not otherwise attend without this opportunity. Winners of scholarships will not be announced publicly. Please submit the essay to ohionorth@scbwi.org no later than 11:59 PM on Friday, March 1. 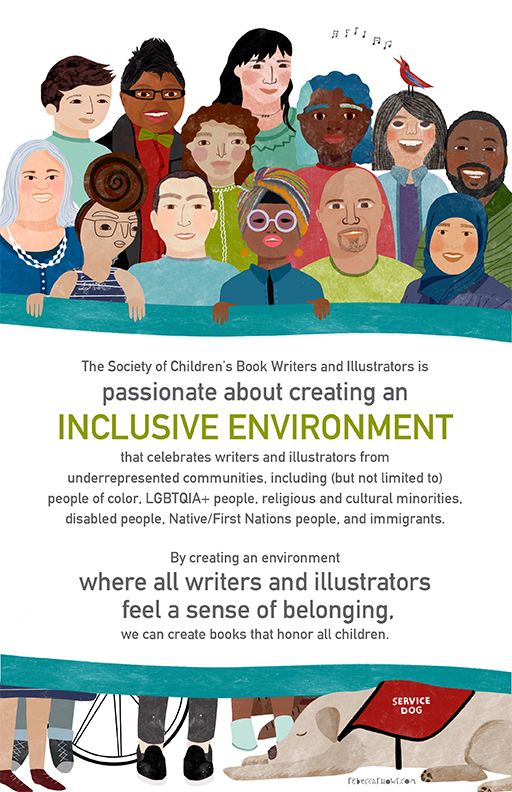 The mission of the Society of Children’s Book Writers & Illustrators-Wisconsin (SCBWI-WI) Diversity Committee is to welcome, celebrate, and support Wisconsin writers and illustrators from backgrounds that are underrepresented in the children’s publishing industry. In line with this goal, we’re excited to offer at least one grant to attend the SCBWI Marvelous Midwest Conference in Naperville, Illinois on May 3-5, 2019. This event is an excellent opportunity to meet agents and editors, meet other writers and illustrators, connect with a critique group, and more! Although we don’t choose recipients based on financial need, we ask applicants to keep in mind those writers and illustrators who could not otherwise attend the conference without this opportunity. Thanks! You haven’t won an SCBWI-WI full conference grant in the past, such as a grant to the SCBWI-WI Fall Conference. You identify as a person belonging to a community that is underrepresented in children’s literature. These communities include but are not limited to, people of color, LGBTQIA+, religious and cultural minorities, persons with disabilities, Native/First Nations, immigrants. If you’re unsure about your eligibility, feel free to ask us at wiscbwidiversitycommittee@gmail.com. You have not yet published a book for children or teens through a PAL-level publisher. You can find more details about what that term means on our PAL Guidelines page. A statement (about 250 words, max) about how you personally identify with a community that is underrepresented in children’s literature. A statement (also about 250 words) about how this conference could benefit you as a writer or illustrator. Up to 5 pages of a single written project (double spaced, 1-inch margins all around, in a word document format), or up to 5 pages of illustrations. Please make sure your name doesn’t appear anywhere on these pages. Send your application our way! Applications are due on 11:59 PM on Friday, March 1. Please send your application, and any questions you have, to wiscbwidiversitycommittee@gmail.com. We’ll let you know by March 11th whether or not we’re able to offer you the grant. If you don’t receive a grant this year, we still encourage you to attend the conference. Sign up by March 26th for early bird pricing! SCBWI-MI Webinar Library: Register and Learn!